You are here: Home / Ethnic Groups / The People of Sumatra / Who are the Kaur? 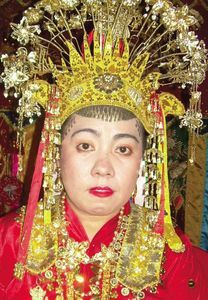 The Kaur are one of the original peoples of Bengkulu Province. They were originally from Bintuhan in the South Kaur district of South Bengkulu, but today many live in the North Kaur district. The Trans-Sumatra highway passes through Bintuhan, the district capital of South Kaur. The Kaur speak their own language, which is part of the Malay language cluster. Most Kaur villages are located in groups along the banks of small rivers in this area. The Kaur area is near where the Seraway and Besemah peoples live. Geographically, the Kaur may be divided into two subgroups. Those who live in the South Kaur district are normally called Bintuhan. Their dialect is greatly influenced by the Lampung dialect. Those who live in the North Kaur district have been influenced by the Besemah people. The Kaur depend primarily on rice cultivation for their livelihood. The area is also known for clove and pepper production. Other major crops include peanuts, coffee, rattan, and fruit–especially banana, mango, pineapple, and durian. Other jobs include tending livestock, fishing, and trading. Kaur men work in the fields while the women manage their households. Although the Kaur live along the beach, very few are fishermen. The few who become fishermen use boats without engines, so they cannot go very far out into the ocean. However, a few people have become fishermen using motorboats and their income is considered quite high. The Kaur live in tin-roofed houses with access to electricity. One unique feature of Kaur houses is that they are all painted blue and white. Traditional wood-burning stoves are commonly used for cooking. Each house has a well in the backyard. Chickens, ducks, and cows roam freely. ‘Gotong royong’ (mutual cooperation), a traditional system of working together, is a still a strong custom practiced by most Kaur. This custom is evident in the assistance they offer each other during harvesting time. The Kaur are not allowed to marry someone from the same clan but may marry a Kaur person from another village. Weddings can only take place in the part of the year after the Rice Harvest Celebration. Most men marry around twenty and women around fifteen or sixteen. If the groom wants his bride to live with his family, he must pay a dowry to the bride’s family. If the groom goes to live with the bride’s family, her family is only obligated to give a token gift to the groom’s family. The older generation had large families, but because of the government sponsored family planning program, most families now only have three children. The Kaur people have been Sunni Muslims since the 17th century. Like other Malays, they observe religious ceremonies with a communal meal (sedekah) to celebrate a birth, give thanks for a harvest, ask for rain, and ward off evil spirits. Currently, the Kaur need better technology in order to increase agricultural production so they can produce enough food for their own consumption as well as for trade. Kaur villages near beaches have not yet tapped into the ocean as a source of income.